Exhibition program cover for Men of the Montaña (1951), American Museum of Natural History (AMNH). Inside pages of the Men of the Montaña exhibit program. Backside of the Men of the Montaña exhibition program, which includes research and curation credits. Archival sketch that illustrate the sequence of sounds in the Men of the Montaña exhibition. The sounds changed throughout the day (e.g. a "frog loop" is indicated from 5-8PM). Archival sketch that illustrates another sequence of sounds in the Men of the Montaña exhibition. Museum Memo that focuses on the Men of the Montaña exhibition and its audio accompaniment. American Museum of Natural History, November, 1951, Vol. 1, No. 4. Courtesy of the Ralph Rinzler Folklife Archives and Collections. Courtesy of the Ralph Rinzler Folklife Archives and Collections. LP cover Sounds of a Tropical Rain Forest in America, originally released on Folkways Records in 1952. 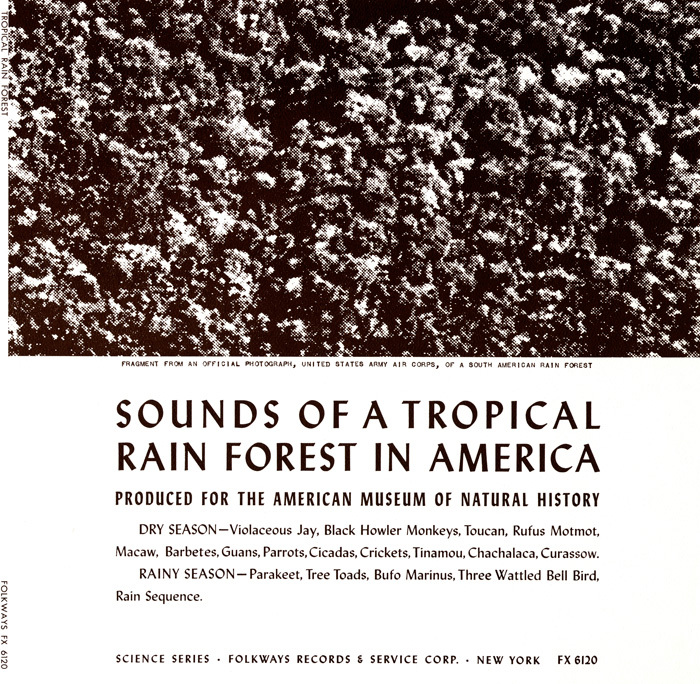 Liner notes of Sounds of a Tropical Rain Forest in America, which include newspaper clippings that review the original exhibition and praise its use of sound. Original LP labels for Sounds of a Tropical Rain Forest in America, which was the inaugural album in the Folkways Science Series. I am very much interested in issuing a series of ‘nature and science’ records in which I will attempt to reproduce the sounds within the content of time etc. and in the drama inherent therein, rather than in the way it has been done up to now of identifying each sound by the spoken word, description. This seemingly simple idea was actually a dramatic shift in how nature records were produced and understood. The older model was based on a traditional in-person science lecture, with a professional who would announce and often describe what listeners were about to hear. This model did not go away overnight; in fact, many Science Series records employed it through the 1970s. But Asch no longer wanted to reproduce lectures, he wanted to use the medium of sound and the material of nature to create a sonic narrative. To create this particular narrative, Asch utilized many techniques that were already common in both the popular cinema and the experimental music of the mid-century: cross-cutting, tape splicing, and combining material from diverse sources into the same "scene." He did this with the explicit blessing of the museum staff; it was curator Dr. Harry Tschopik who told Asch that Kellogg had a good recording of rain forest sounds from Panama. Upon request, Kellogg agreed to share them, and after the exhibit opened, Asch again wrote to Kellogg to tell him that the recording seemed to be "accepted by the public." As if afraid of being exposed for using Panamanian material in a Peruvian exhibit, Asch expressed relief that the recording had "passed." But once it passed, the story of Sounds of a Tropical Rain Forest in America was really just beginning. Because of its connection with the much-celebrated museum exhibit, it was subjected to some of the highest scrutiny of any Science Series release. While it is clear that Asch et al. did their best to present the Science Series as, well, "science," what actually happened was a creative endeavor that reveals larger insights into the culture and commodification of environmental sounds. Once all of the sounds were compiled, Asch's original aesthetic ideas for the Science Series were applied. It was arranged without a narrator, with one to two minutes of sound standing in for each hour of the day. After this, a test pressing was made and played to all of the people connected with the project. The resulting criticism noted that the sounds were too numerous and clustered. After things were pared down and spaced out, the original tape was transferred to record and given to the museum. With surprisingly little sense of irony, even the people who documented the strange ways that this album was recorded made affirmative statements regarding its authenticity. Berger, early in his article, says that the methods were undertaken because the curators firmly insisted on an "authentic background." Likewise, Goldsmith, after the bathtub anecdote, interjects that few doubted the album's authenticity. But what is it, exactly, that this album accurately portrays? It certainly does not portray the Peruvian rain forest—or any rain forest, for that matter. Ultimately, Sounds of a Tropical Rain Forest in America did not portray any particular rain forest, but simply the idea of a rain forest. Asch knew, or at least intuited, that at the heart of any nature recording was a feeling as much as a place, an idea of nature as much as the physical reality of it. This is the paradox at the heart these natural sound reproductions: even if the content of the recordings are revealed to be inaccurate, the material can retain its "realness." On the one hand, the success of the Men of the Montaña exhibit can be seen as the ultimate triumph of sonic fakery, but on the other hand, it is an unheralded triumph in imaginative sound editing. Craig Eley is a Ph.D. Candidate in American Studies at the University of Iowa, and was recently a Smithsonian Predoctoral Fellow in the Center for Folklife and Cultural Heritage. His dissertation project, “Making Silence Audible: Sound, Nature, Technology, 1890-1970” is a cultural history of nature records. 4 Museum Memo 1:4 (November 1951). Box 1429.2, American Museum of Natural History Archives.